With a stunning coastal Grand Depart, our first weekend of the Tour had a holiday feel, and temperatures that made that Atlantic look all the more welcoming – but we had some cycling to do! These first 2 stages were the perfect opportunity for less experienced riders to join the peloton for a big challenge. 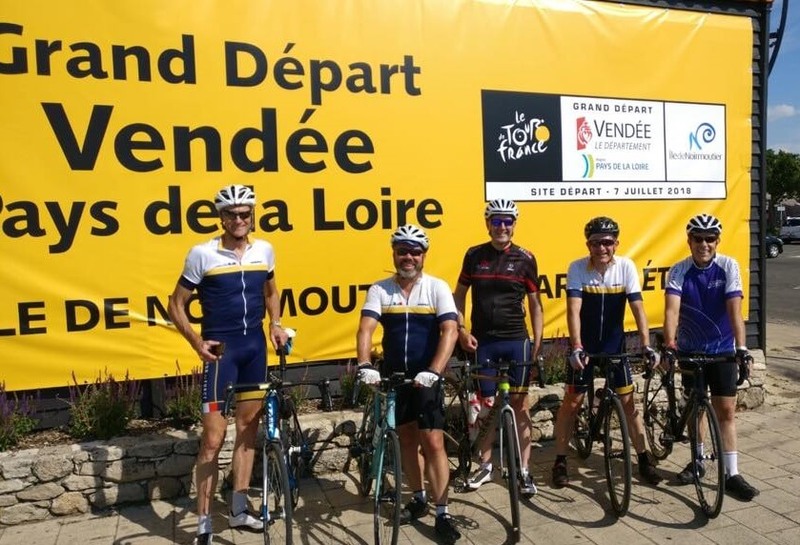 In particular we were delighted to welcome back the Alitex Team for their 3rd Tour with us, proving that you don’t have to be a mad keen roadie when you sign up to Le Loop … but with sensible preparation and a big heart, it’s still possible ride a couple of stages of the Tour de France! North we continued, in slightly cooler (and occasionally damper) weather, through Brittany, which was shown in all its glory. There’s a reason this part of France has a strong cycling culture; the roads are glorious! 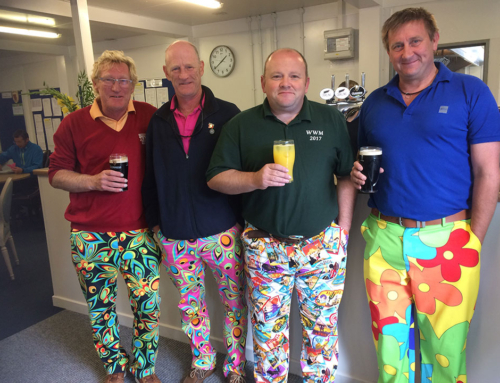 During these stages, it was noticeable how strong the camaraderie had become. The ‘class of 2018’ proved to be one of the most welcoming, supportive, inclusive and delightful groups, remarked upon by all. A small group of game Loopers joined us for a weekend of flattish and charming northern French countryside, paying homage to Roubaix as we reached the daunting, but ultimately satisfying cobbles of stage 9 before our first rest day. Beholden as we are to the route designed by A.S.O, who organise the pro tour, our rest day was dominated by a long train and coach transfer to the Alps, but at least the legs got a rest! This rest day welcomed a big group of new Loopers, as well as our first charity visitors (William and Jordan from Regenerate), eager to tackle the 3 big Alpine stages. Sun and blue skies showed off the stunning mountains in all their glory. These were gruelling but beautiful stages that would really test our mettle, but fortunately we had the luxury our aching limbs needed with two particularly fabulous hotels in La Rosiere and Alpe d’Huez. Stages 10 and 11 were everything you’d hope for; dramatic, beautiful and exhausting (!) 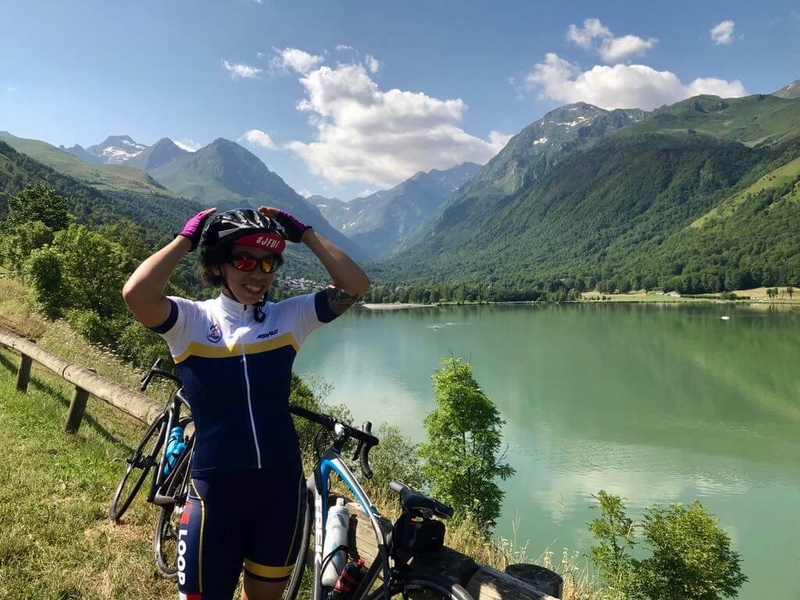 – but the memories that stick with us from these days in the Alps are the fun, chat and amazing feedstops as our Le Loop peloton laughed their way up and down the spectacular Alpine roads. What a way to experience climbs (such as La Rosiere) that would prove to be so pivotal in the pro race one week later! Their culmination in stage 12 ensured that this would be 3 days of riding that would never be forgotten. 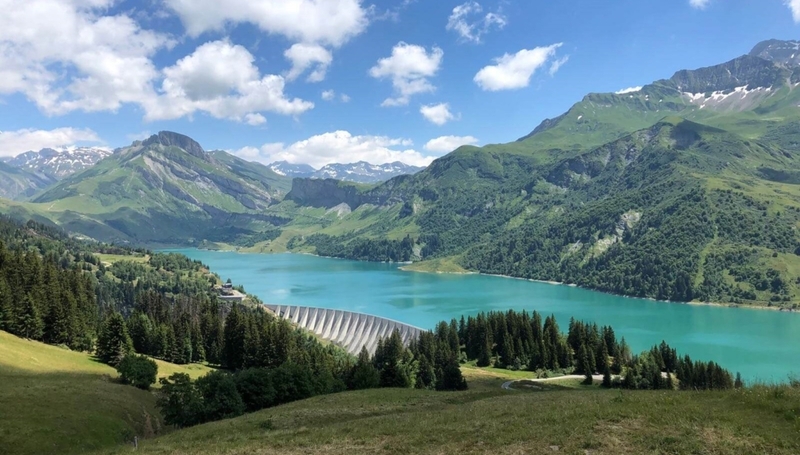 It took us on a true cycling journey; the infamous Col de la Madeleine, the alarming switchbacks of Les Lacets de Montvernier, then Col de la Croix de Fer and ultimately, the iconic 21 hairpins of Alpe d’Huez. We had our longest day ever on tour, with our final heroic riders pedalling into the hotel at 1am, having started riding at 8am. Determination like that is quite something to witness and all our riders did themselves proud that day. Next we headed South into the Cevennes and on through the Massif Central, enjoying beautiful villages, vineyards, sunflower fields and gorges. It’s easy for others to overlook these middle mountain stages but for us the beauty of the tour lies in the hidden corners of France that are best viewed from a bike. Stages 13, 14 and 15 which took us to our second rest day in Carcassonne were a joy from beginning to end and left us smiling from ear to ear: pure, southern French, cycling joy! Stage 16 took us to Luchon, high in the Pyrenees with a little foray into Spain en route. Then stage 17 was a particular highlight: only 65km, but packed with climbs, leg-licking sheep, cows in pitch-black tunnels and views to die for. It was a day with time and energy spare to take photos, have fun and really enjoy this beautiful, craggy, atmospheric mountain range. We were joined on stage 17 by Sarah and Skye from Access Sport and it was an absolute pleasure to share the Pyrenees with them and to watch them rise to the challenge of the Tour like absolute heroines. Chapeau! Stage 19 was the final big sting in the tail of the 2018 Tour. 200km that took in the Col d’Aspin, Col du Tourmalet and Col d’Aubisque, the rain and low cloud stole the views, but perhaps saved us from searing heat and dehydration. It was a huge day on the bike that marked the end of the serious stages of the Tour. From here, we only had a time trial (a short but fascinating glimpse of Basque culture), flight to Paris and the glory ride down the Champs Elysee to complete. The sunshine, arrival of friends and family and sipping champagne on a private diner cruise down the Seine made this a very special day – a celebration – of a really fantastic tour.